It is a common myth that the only way to have a great yard is to invest a lot of money into it. With a few tips, you can have the yard of your dreams without blowing your budget. First impressions are often the most powerful. For a person’s home, the front yard equates to a first impression. One of the best ways to create a stunning front yard is to create a visual path through the yard to the front door. Walkways are simple to create. 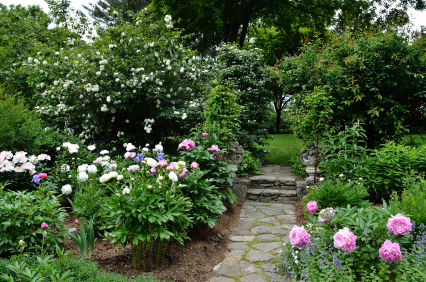 You can do a simple brick path, lined with shrubs, or even flowers. If you already have a concrete pathway, line it with mismatched slate or stones to give it a facelift. This will be sure to give your front yard a “wow” factor. A tangled up hose on the side of the house is not only an eyesore, but also very inconvenient when you need to water the garden. Find an old bedside table at a garage sale or online. Cut the back of it out and place it against the house where the water nozzle is placed. Coil up the hose and place it inside the bedside table and close the doors. Place a few nice plants on top for a stylish container for your hose. Spray this on weeds for a quick kill that won’t harm your garden or your family. We are full of great tips on how to improve your yard on a budget. Contact Blooms Landcare at (817) 688-5352 to speak with us regarding your needs!